First off, I have to warn you that this review will probably contain spoilers from Uglies and Pretties. The books in this series just don't stand alone very well, so it's impossible to discuss them without talking about events that happened in previous books. If you haven't read the series, I urge you to start from the beginning. So, we last saw 16-year-old Tally Youngblood in the clutches of a squadron of Specials, who want to make her one of them. Abandoned by the New Smokies and afraid for her very ill boyfriend Zane, Tally has little choice but to surrender. Before she knows it, her body is remade. Numerous operations leave her with "icy new muscles and reflexes tweaked to snakelike speed" (5), which make her especially adept at her job of "tracking down the city's enemies and bringing them to justice" (25). In short, Tally Youngblood is a Special. In fact, she is a special Special - as a Cutter, she's authorized to defend New Pretty Town on her own terms. Although Tally received the Specials operations against her will, she loves being Special. Not only is she part of a "connected ... unbreakable clique" (8), but now "everything [is] laid out clearly, like looking down on a forest path from above" (9). Only two things mar her happiness: her uneasy alliance with her double-crossing best friend Shay, and the fact that Zane is not yet a Special. "Ancient dramas" (23) aren't supposed to matter to Specials, but it's clear to Tally that Shay hasn't quite forgiven her for what she sees as past betrayals. As leader of the Cutters, Shay is smug and cruel - she commands Tally to "stay icy" and forget about Zane, who is, afterall, a bubblehead and not a Special. Tally can't quite give him up, especially once she sees how weak he has become. Although the "perfect clarity of her vision" (82) makes all his imerfections stand out, she still feels responsible for him. She knows the passion she felt for him will return ... as soon as he becomes a Special. The irritating thing is that Zane doesn't want to be a Special. His brush with crude Smokey medicine has left him a shaky wimp, but he still wants to help the rebels. Already, he's passing pills around New Pretty Town that will cure the bubbleheads, reverting them back into independent thinkers. He's as guilty as the other Smokies. Shay finally persuades him to lead the Specials to the Smokies new hiding place in exchange for his freedom. Although Shay mocks her weakness, Tally insists on being the one to follow Zane on his journey into the Wild. As she tracks him day after lonely day, Tally finds herself questioning her new identity. Does she really want to be Special? Even when it requires a "mind ... turned against everything random and average and ... crippled" (191)? Tally's tracking assignment is supposed to end with a quick takeover of the rebel base by Shay's special forces, but what she finds shocks her. The New Smoke is nothing like she imagined. Suddenly, her whole world is turned upside down and Tally's on the front lines of a war she, herself, started. Her Pretty world does not include military helicopters, hand grenades and revenge killings, but things have clearly changed. Can she save her world from madness? Can she get Zane the help he needs, and turn him into the Special she needs him to be? Can she even save herself? Can she answer the biggest question of all - who is Tally Youngblood? She'll face all of these questions as Specials speeds toward its surprising conclusion. 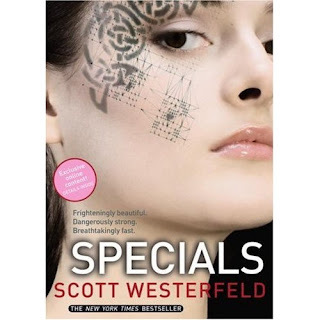 Most YA books deal with this issue, and I think Westerfield makes the "Be yourself" point pretty well. Uglies and Pretties both came off as preachy to me - Specials is less so. Besides, the novel's morals get good and camouflaged behind all the action. When Tally's zipping through the air on her hoverboard, desperate to fling herself into a whirring helicopter, you're not asking yourself, "What does this mean?" - you're just holding your breath, waiting to see what happens. Note: In the back of my edition of Specials, there's an ad for Pulse It, Simon & Schuster's new spot for teens. It offers free YA books in exchange for reviews. The only catch is you have to be between 14 and 18 (Dang - I only missed the cutoff by a couple of years). Check it out if you're in this age group - it looks cool. That is fuuny, I liked each book in the series less because I felt they became more preachy. I thought this one lost all credibility about teaching being "true to yourself" and could only barely bring myself to read the last book. That's funny that our opinions are so opposite! I think all of the books are preachy to some degree, but to me, they seem to get progressively less so, although Extras is almost (maybe more) preachy than Uglies. Just out of curiosity, why do you think Specials "lost all credibility about teaching being 'true to yourself?' I didn't feel this way because I think that Tally is still confused about her identity, still trying to decide where she belongs - I believe she will figure it out by the end of the series. That's what I'm hoping at least! Great review, as usual! It is hard to review this without spoilers. I thought it strange that when given the chance to regain her humanity, she instead chooses to keep the psychological damage forced upon her. I thought it was pretty clear she was not “fixing” herself like she had in the other books and that the anger and resentment was artificially induced, and not true to her natural personality. Was the point that her artificial, forced enhancements were better than her true self? To me the whole message of the series was that, with strength and perseverance, you can overcome the pressures around you and find your true self (and free civilization is in direct conflict of the earth's best interest). In this book she seems to accept that the lifestyle forcibly thrust upon her as better than finding out who she truly is. I didn’t see any indication that she was overcoming the brainwashing on her own or I would have felt better about the ending. I guess that the last book shows some progress, but it still irritated me that she choose to keep her artifical identity instead of beginning a search for a truer one. I haven't read these books, but they sound really interesting. I need some YA, my tbr pile is full of a biography and other serious stuff. I just finished Specials and, though I'm a bit behind the blog, this was the best place to vent. I liked the series overall, but I agree with Charlotte that they got very preachy about the environment. Especially right there at the end. I hated (hated!) the lone-ranger-into-the-sunset ending. The stupid ping to her friends and allys declaring herself the guardian of the wilderness, so she's not going to be helping to build the cities into a sane pattern with sane environmental protection laws--she prefers to be lord high oompa of whether everyone else is doing a good enough job of it, stepping in to try to stop the spreading destructive madness of millions of people rather than just helping to shape their infant policies before the destructive thinking takes hold! If there was ever an indication that she hadn't rewired herself out of her superiority complex (etc), it's that Tally Youngblood, who loved being part of a clique through three incarnations, believes she'll be content alone in the wilderness with David. She pulled so many martyr moves during the series (going to the smoke, volunteering to be pretty, staying behind with Zane and becoming Special) I really wanted some resolution that allowed her to keep something! And the nasty cruel-pretty makeover doesn't count! Ugh! I like David, don't get me wrong, and I'm glad they're together, but the ending sucked. I'm glad to hear that, in Extras, Tally has a group again and is once again part of society. I really, really hope that she has blended with the blessing of the world's governments and isn't still just a vigilante.